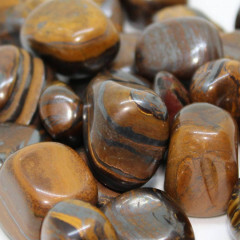 An interesting gemstone – it looks similar to Tigers Eye, but is comprised of several minerals and gemstones, including Hematite, Jaspers, and golden Tigers Eye. A gorgeous stone with an appearance similar to golden Tigers Eye. 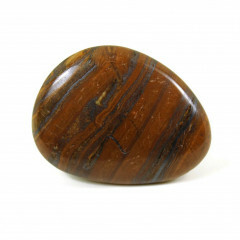 It is usually comprised of Ironstone or Hematite, Tigers Eye, and some colours of Jasper – primarily reds or yellows. It may also contain chert or quartz, in various colours. There is not a massive amount of information available online for this stone, unfortunately. The majority is mined in Australia, and South Africa. It is primarily used as a decorative object – carved into beads or cabochons mostly. Larger pieces such as skulls and ornaments can be found too. This stone is thought to be helpful for enhancing the performance of the immune system, and is said to boost the function of the kidneys and liver. It is also thought to help with clarity of vision, allowing the holder to see the hidden truth below the surface of a problem or issue. It is related to the root and the sacral chakras.